Fresh Fiction is pleased to welcome international bestselling author Belinda Alexandra to discuss with Features Editor Pasha Carlisle the sweeping journey of WHITE GARDENIA. Pasha: Welcome, Belinda! 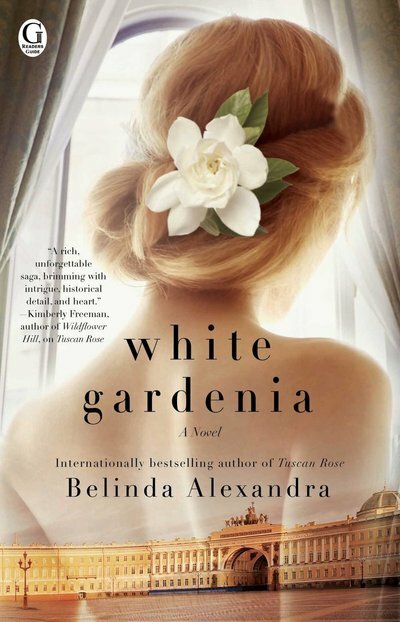 From Russia to Shanghai to Australia, WHITE GARDENIA sweeps readers all across the world. How have your own travels influenced the globe-trotting background of this novel? Belinda: For me, travel has always been an enriching experience. Understanding other cultures, languages and history adds so many layers to my own experience of life. But no matter where I travel, I�m always struck by how much the human race has in common � especially in regards to our basic desires to love, to grow, to create and to connect. I�ve always found travel a pleasure because it�s been a matter of choice for me. But for many people who have had to flee their homes because of wars and revolutions and have had to adapt to another culture, the journey has been one of culture shock and resilience. The way these people survive and adapt fascinates me. Pasha: WHITE GARDENIA begins in the city of Harbin near the end of World War II. Could you tell us a bit about the city and why you chose it for this story�s initial setting? Belinda: Harbin is a city in China that borders with Russian territory. Many Russians fled to there after the Revolution, when the Tsar was deposed and the Communists came to power. These displaced Russian nobility turned Harbin into a city with a distinctive Russian flavor � Orthodox churches and cemeteries, Russian style buildings, bakeries and ice festivals. I was fascinated by the idea of a group of people having to leave all that they had known and then trying to reproduce that exact life somewhere else. Pasha: Your mother is Russian, and your father is Australian. How did your heritage help inspire the story in WHITE GARDENIA? Belinda: I drew on my mother�s family history as inspiration for �White Gardenia�. I grew up in a lovely, safe part of Sydney and around optimistic, happy-go-lucky Australians. But I was aware of this dark past in my family. I didn�t have any uncles, aunts, grandparents, nieces or nephews. I only had my mother�s photograph album of sepia pictures of beautiful smokey-eyed women and dashing men. But many of those people had been executed or had died in Soviet Union labor camps. I wanted to know about my Russian cultural heritage and the journey my grandmother had made from Russia to China and then to Australia. Pasha: When you are not writing, what do you do for leisure? We have heard you are still quite the traveler. Belinda: I do love to travel and have recently returned from a trip to New Orleans. When at home, I love to go ballroom dancing with my husband, Mauro, play the piano, garden and spend time with my beloved pets. My perfect day is when I get to do all those things and then meet up with good friends afterwards! Pasha: Thank you for being our guest, and we have one last question. What�s on your to-read list this year? Belinda: It�s been my pleasure! I�m looking forward to reading Kimberley Freeman�s novel �Evergreen Falls� , a mystery set in the Blue Mountains west of Sydney, as well as �Life After Life� by Kate Atkinson. I enjoy reading non-fiction too especially on the topics of music, travel, animals, interior design and biographies. On my bedside table at the moment I have �Houseproud: Unique Home Design Louisiana,� by Valorie Hart which is so visually beautiful, it�s sending me off into sweet dreams each night. In a district of the city of Harbin, a haven for White Russian families since Russia�s Communist Revolution, Alina Kozlova must make a heartbreaking decision if her only child, Anya, is to survive the final days of World War II. White Gardenia sweeps across cultures and continents, from the glamorous nightclubs of Shanghai to the austerity of Cold War Soviet Russia in the 1960s, from a desolate island in the Pacific Ocean to a new life in post-war Australia. Both mother and daughter must make sacrifices, but is the price too high? Most importantly of all, will they ever find each other again? Rich in historical detail and reminiscent of stories by Kate Morton and Lucinda Riley, White Gardenia is a compelling and beautifully written tale about yearning, longing, and the lengths a mother will go to protect her child.